Scan your computer with MacKeeper Removal Tool. This will remove all traces of MacKeeper and the malicious browser extensions it installs. How to manually remove MacKeeper? When you’ve done that, drag the MacKeeper app to the trash. You may be prompted for your administrator’s password. Enter it and the MacKeeper app will move to the trash and a window will pop up and offer to uninstall the rest of its components. 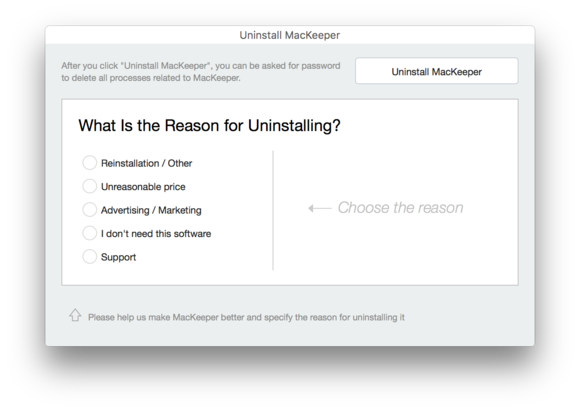 Click the Uninstall MacKeeper button (don’t bother selecting an option about why you’re doing so if you don’t care to). This should remove most of the files MacKeeper placed on your hard drive. If you have a recent version of MacKeeper, the uninstaller does a good job, and Macware Antivirus can help clean up any bits left behind. But not all of them. Although the window tells you that all MacKeeper-related processes will be deleted, a few things remain. A MacKeeper Helper folder isn’t removed. You can find it by visiting this location: ~/Library/Application Support. (To access this Library folder hold down the Option key and, in the Finder, choose Go > Library.) Inside this MacKeeper Helper folder is a NoticeEngine.plugin file. Go ahead and toss the MacKeeper Helper folder and this file will disappear right along with it. Empty the trash, restart your Mac, and MacKeeper will be gone. If you don’t see the MacKeeper Helper folder, don’t worry about it—it’s only bad if it’s there. While we’re making sure the uninstaller got everything, here’s a few more places to check. The most recent version of MacKeeper as of this writing (3.7, build 979) did get all of these on the uninstall, but it’s still smart to double-check. How to remove MacKeeper Adware? MacKeeper also installs unwanted browser extensions which either inject ads into your web browser or displays annoying ad pop-up windows. You can uninstall the extension by selecting Safari > Preferences > Extensions > Select the MacKeeper Extension (it may be listed as another name, so just uninstall anything you don’t remember installing yourself) > Uninstall > Restart Safari. You can uninstall the MacKeeper extension by selecting: Firefox > Tools > Add-ons > Extensions > Find the MacKeeper Extension (it may be listed as another name, so just uninstall anything you don’t remember installing yourself) > Remove > Restart Firefox. You can easily uninstall the the MacKeeper extension by selecting Window > Extensions > Find the MacKeeper Extension(it may be listed as another name, so just uninstall anything you don’t remember installing yourself) > click the Trash Can icon.